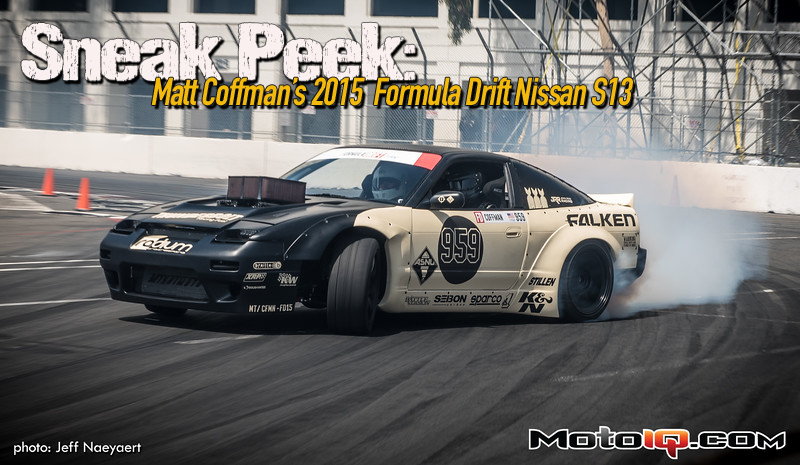 21 year old Matt Coffman is currently in his second year of Formula D competition. The second youngest driver on the Formula D circuit, in his freshman year Matt campaigned his S13 to 33rd in points. Lacking experience Matt had a tough time on his first Formula D tour and didn’t qualify for 3 of the 7 rounds. For his second time around, Matt and his team have attacked the season with renewed vigor, building a new car and having an aggressive pre season test schedule to enable Matt to become more familiar with his new ride. Matt’s team consisting of Crew Chief Bill Conway, Nick Byatt, Jeff Mailley and Spike Chen has worked really hard in the off season to put together a strong program for Matt and the team is truly one of the best privateer teams in Formula D.
Growing up driving sideways on the dirt roads around his Medford Oregon home and starting his competition career in rally has given Matt a good base to build on. 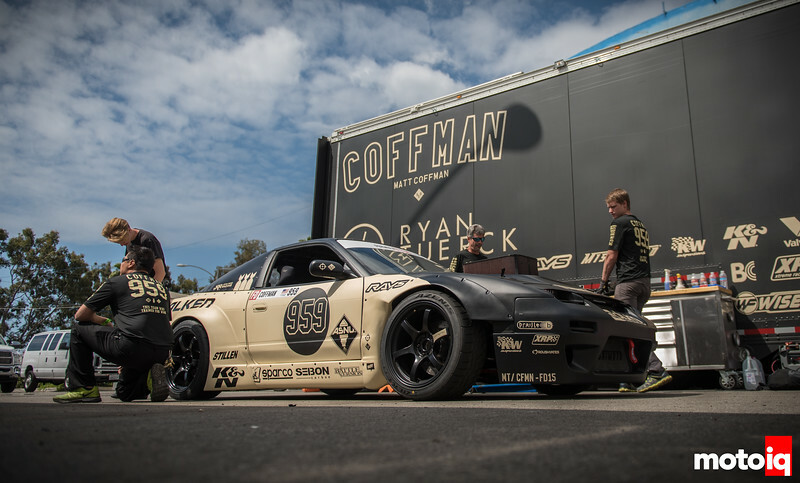 He has rapidly made the transition to drifting, rising from the level of just messing around at local drift events to getting his Formula Drift Pro license in a very short amount of time. Matt’s new S13 really caught our attention on media day. Since we know a little about the S13 chassis we can say that Matt’s new car shows a high degree of build quality and technical sophistication. It is perhaps one of the nicest S chassis cars to run on the Formula D circuit. Let’s take a close insider’s look at Matt’s new ride. The Coffman Racing crew run a tight ship and we were impressed by their professionalism even withon a small privateer’s budget. You will not find a nicer bunch of guys either. Matt’s car is very cleanly built with topline parts and set up well. With good support, look for this young driver to do much better the second time around! The Coffman Racing S13 is not powered by the typical Chevy LS or small block but instead by a Roush Yates Ford FR9 410 Sprint Car engine. At least it started life that way before it was reworked by Matt Rodgers at Rodgers Racing Engines for a broader powerband and more torque. The engine was switched over to Thunderbolt E99 bio ethanol fuel and it runs an extremely high compression ratio of about 14:1 and a cam with a tighter lobe separation angle and less duration for more bottom end and midrange torque. 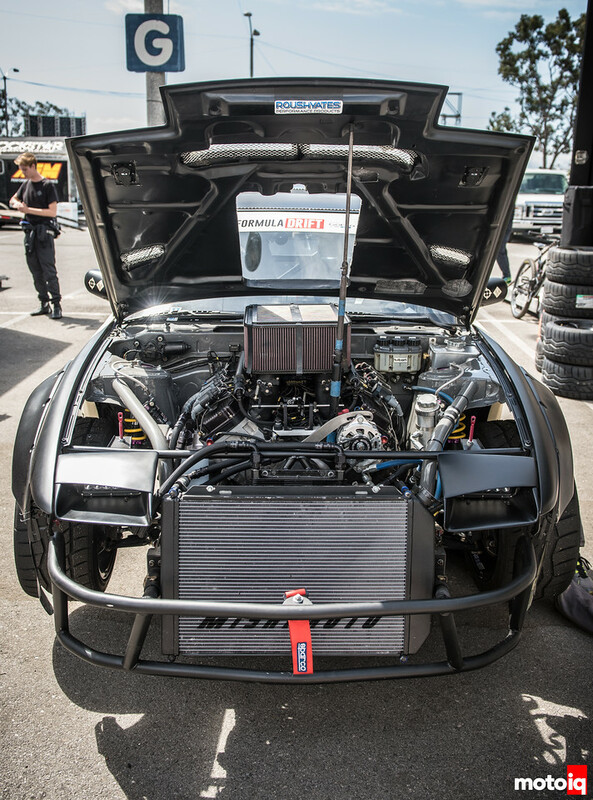 A huge Mishimoto black series radiator dominates the front of the car to keep things cooler than cool. 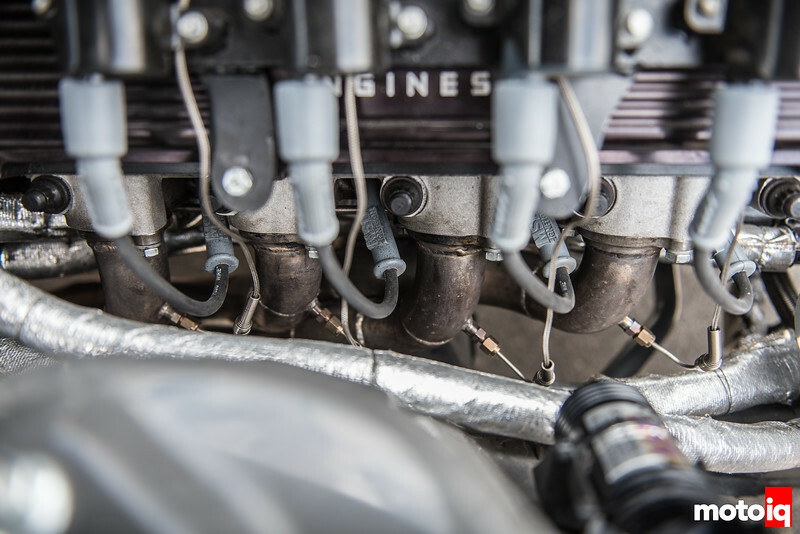 The Ford engine was chosen because it has been extensively developed by Roush Yates and simply makes more power than the Chevys in an off the shelf package. 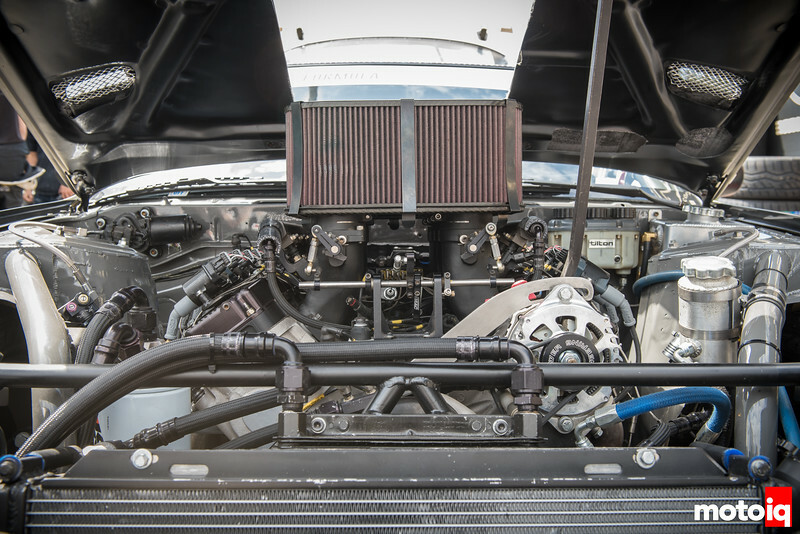 The Ford engine features Kinsler ITB injection, the minimal runner volume and 8 throttle blades make for very fast throttle response with excellent mid to top end power. The ITB’s feature 60mm throttle bodies and huge 1100 cc ASNU injectors. The ITB’s are responsible for the car’s unique engine note. The Ford engine is a much bigger package than the compact LS Chevy engine and is positively huge compared to a Small Block Chevy. The Ford cylinder heads are much wider and the deck height of the Ford block is about an inch taller. While an LS or Small Block Chevy is considered to be an easy fit into an S chassis the Ford takes a little more doing. The custom stainless headers bend tightly around the exhaust port for clearance and have to be dimpled a bit around the shock towers to make room in the tight confines of the S13 engine bay. For this year the headers have been modified with longer primary tubes for better mid range. You can see each cylinder has individual EGT probes which allows for individual tuning of the MoTeC M150 ECU for each cylinder.